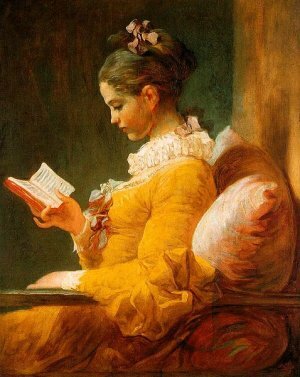 Jean-Honore Fragonard (frah gaw NAHR) was a French artist who lived in the 1700's. When he was 13 years old his father wanted him to become a clerk, but his heart was not in it. He wanted to paint. They took him to study with the artist Francois Boucher (frahn-swah boo-SHAY), but he said the lad wasn't ready. Boucher told his mother he needed to train under Chardin (shar DA(n)) first. Chardin set him to copying the prints of masterpieces, but he didn't progress, so Chardin also dismissed him. 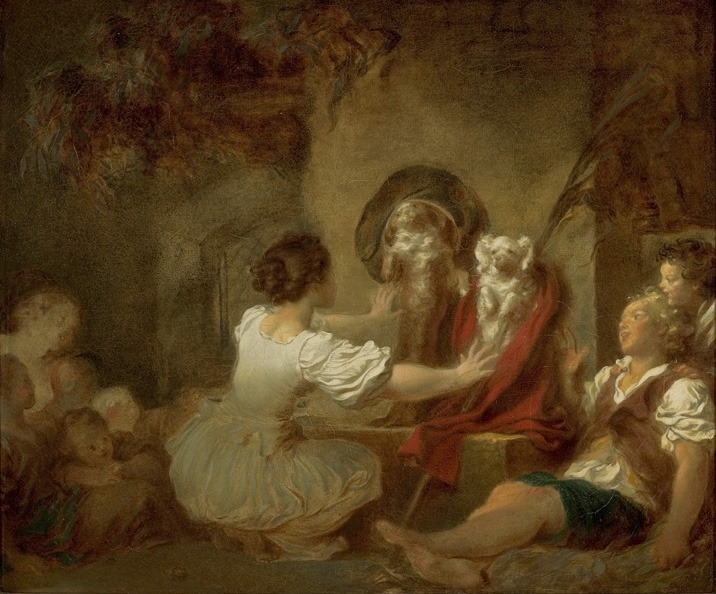 Fragonard visited the churches in Paris day after day and returned to his room to paint them from memory. When he returned to Boucher six months later the master was astounded at the progress he had made and took him as a pupil. He put him to work drawing "cartoons", pictures which would be made into tapestries. 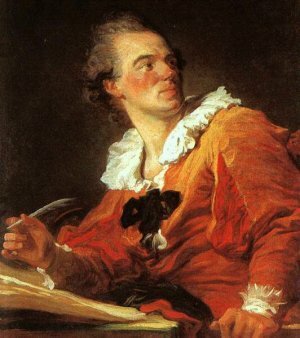 Boucher sent Fragonard to Rome where he studied the masterpieces of Michelangelo and Raphael, but it was the bright colors and landscapes of Italy which had a greater effect on him. His teacher urged him to compete for the Prix de Rome (pre deh roam) and without preparation he won with the painting Jeroboam Sacrificing to the Idols. He would be almost thirty years old before he would return to Paris. For three years he continued to work in Boucher's studio which was now at the Louvre. He spent the next five years traveling at the king's expense to Rome and Venice. Upon returning to Paris he was approached by Baron de Saint-Julien to paint The Swing. The trees are prominent in the picture. He was in demand as people craved the new themes he was painting. Fragonard opted to paint the frivilous themes people wanted to buy and became rich. Boucher had become old and introduced "Frago" as he called him, to Bergeret de Grandcour who became his most lavish patron. His paintings were in the style of what is called the Rococo period. These paintings featured soft colors and natural, carefree scenes. The Swing is such a scene. The Gerard family sent their seventeen-year-old daughter, Marie Anne, to Paris in the care of Fragonard. She was going to work in the shop of a scent-seller. She liked to paint fans and miniatures and Fragonard was chosen to guide her. She was not particularly pretty and was rather clumsy, but the 37-year-old Fragonard fell in love with her and married her when she was 18. They had a daughter, Rosalie and ten years later a son, Alexandre. Marie Anne's younger sister Marguerite and little brother Henri came to live with them. After he married, he began to paint pictures of children and families. His life had a different meaning than it had in the past. Also the featured painting of a young girl reading: The Reader is an example of the different focus of his painting. In the painting "Education is Everything" we see a girl playing school using her dolls and pets as her students. 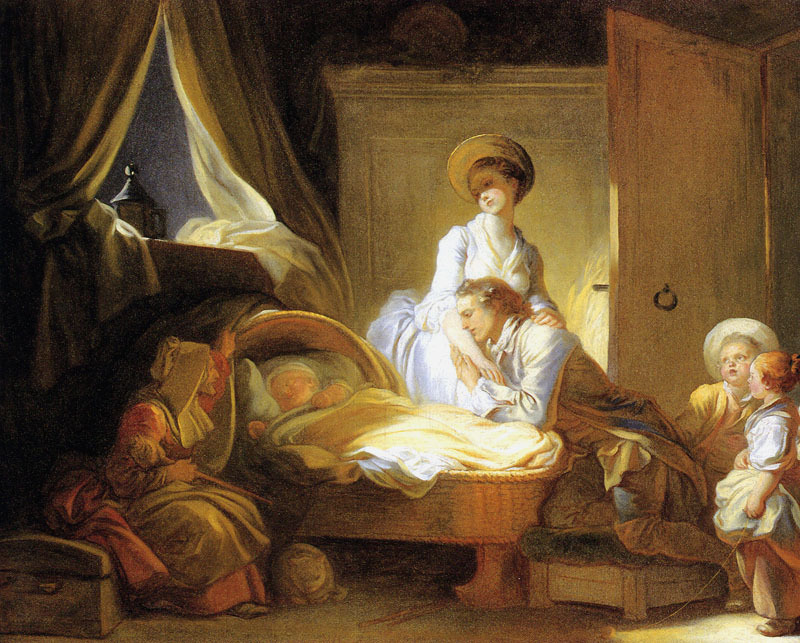 The second painting "Visit to the Nursery" shows an adoring couple watching their baby, the newest member of their family, sleep while the nanny looks on. Mademoiselle Guimard, a dancer, commissioned him to paint a series of panels for her. He wanted to take his time on the work, but she became impatient and kept rushing him to get the paintings finished. He walked out of the house after telling her, "It is finished". He sneaked back in one night and painted the smile on her face into a snarl. His patron, Bergeret de Grandcour took Fragonard and his wife on a tour of Italy. This tour was very different from the one he had made years before as a penniless student. 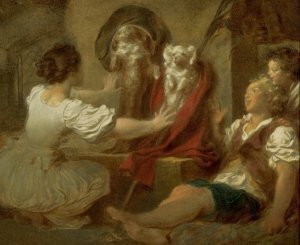 When they returned home Fragonard went to Grandcour's house to retrieve his sketches only to learn that Grandcour wouldn't give them up. He wanted to keep them as payment for the tour. Fragonard sued and the sketches were returned. There was a breach in the friendship, but it was healed and they continued to be good friends. Times were changing for the family. There was political unrest and Fragonard fell on hard times. However, things improved when Louis XVI ascended to the throne. 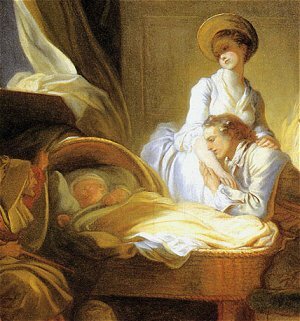 Fragonard again occupied the apartments at the Louvre where he had lived when a student of Boucher. Tragedy struck the family when their 18 year old daughter Rosalie died. Then came the overthrow of the French government. The King and Queen Marie Antionette were killed. Fragonard's patrons were gone. He took his family and left Paris. When the revolution was over and Napolean came to power, they returned to the apartment at the Louvre. He was poor and rarely painted. They were evicted from the apartment and went to live in the apartment of a restaurant keeper. Fragonard was getting old. His paintings had gone out of style and he was poor. He died August 22, 1806 at the age of 74. His wife would live another 18 years. Macfall, Haldane. Fragonard. London: T.C. and E.C Jack, 1909. This page displayed 57,030 times.